In the last couple of years, the level of parity in the NBA has diminished with the Golden State Warriors setting a record for regular season wins and the Philadelphia 76ers nearly setting a record for regular season losses. The recent rapid polarization of the league has concerned many. About a month ago, Kurt Bullard wrote an article about this on our HSAC blog and determined that the NBA would have the world’s most unequal economy based on the Gini coefficient of preseason title odds. His article got me thinking, what if instead of comparing the NBA’s competitive imbalance to other countries (whose economies aren’t based on winning a 7 game series in June), to compare the NBA to other major professional sports leagues over the last 8 years. To do this, I used the preseason title odds provided on sportsoddshistory.com for the last 8 seasons, normalized the probabilities of winning a championship to ensure that they summed to 1, and then calculated the Gini Coefficient of these title probabilities for each of the last 8 seasons. For those unfamiliar with the Gini coefficient, it is a metric used to compare income inequality in different countries. If a country has a Gini coefficient of 0, that means that everyone within the country has the same income level while a Gini coefficient of 100 means that all the income is held by one individual. The leagues I used for this analysis were the 4 major American sports leagues in addition as the 2 biggest soccer leagues in Europe, England’s Barclays Premier League and Spain’s La Liga. Critics of soccer claim that it is boring and unpredictable because the teams that have the most money always end up winning the championship. However, after Leicester City’s remarkable run to the Premier League title last spring and the Warriors and Cavs continued dominance, the bookies odds have the Premier League as the more competitive of the two this season. 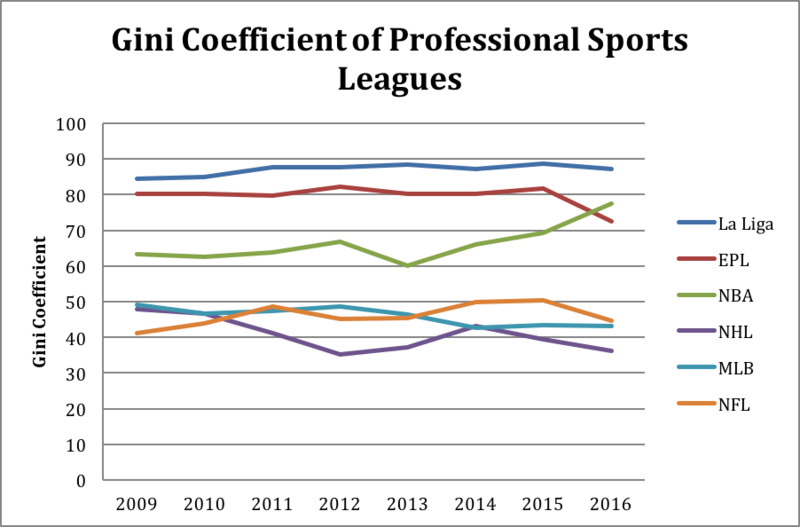 Despite having similar salary cap restrictions as both the NHL and NFL, the NBA has always had a consistently higher Gini Coefficient of title odds, even before the massive upswing this season. This is likely because the high scoring nature of the sport of basketball lends itself to less variance in results combined with the presence of a maximum contract creating competitive imbalance (Al Horford makes the same amount as Lebron). Both the MLB and NHL have had a small decrease in the Gini coefficient of preseason title odds over the last 7 years. In MLB, where the effect has been slightly less pronounced than the MLB, this could be due to the end of the “superpower” era, where teams with huge budgets like the Red Sox and Yankees consistently dominated the first decade of this century. Instead, teams have relied more on analytics and getting more bang for their buck. In the NHL, the sport has transitioned to a younger, faster game, so a potential reason for an increase in parity is an increase in the value of young players and draft picks. This is a finding that isn’t exactly groundbreaking. With 16 teams qualifying for the playoffs and the low scoring nature, there is a high variance when determining who eventually wins the Stanley Cup. Oftentimes, the team with the hottest goaltender eventually rides their luck to the Championship (like when the 6 seed LA Kings beat the 8 seed NJ Devils in 2012). In terms of models, the MLB and NFL are as far apart as they come. The MLB has no salary cap, a 162 game season and a small percentage of teams that qualify for the playoffs and 5 (or 7) game series. The NFL on the other hand, has a strict salary cap, a 16 game regular season and single elimination playoffs. As a result, I would expect the MLB to have a much lower variance in determining their champions than the NFL but surprisingly that has not been the case. This finding was a little puzzling to me. La Liga has traditionally been a two horse race between FC Barcelona and Real Madrid, but in 2013/14 Atletico Madrid broke that deadlock and won the title and have challenged in each of the last two seasons. 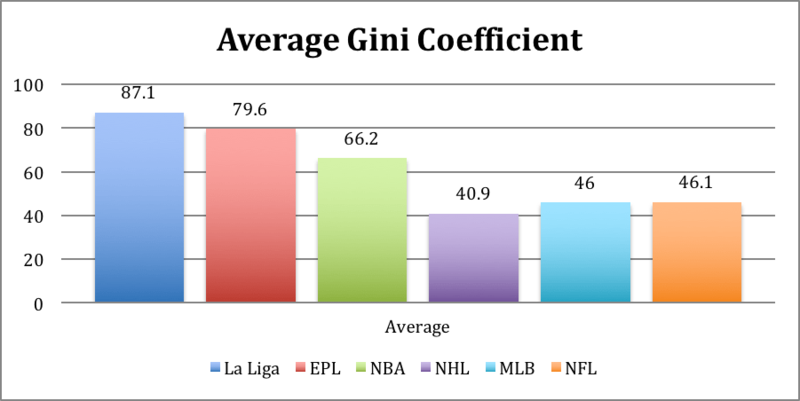 The emergence of an extra team with a realistic chance of winning the title made me conjecture that the Gini Coefficient would go down, but instead it has gone (slightly) up. The first year of this study, 2009/10, was the last year of the “Big 4” Era in Premier League soccer. In the 6 years prior to that, the same 4 teams (Manchester United, Arsenal, Chelsea and Liverpool) occupied the top 4 positions. However, in recent years, Manchester City and Tottenham Hotspur have expanded that moniker to a “Big Six” while Newcastle United and West Ham United have come very close to qualifying for the Champions League in recent seasons. The opening of the Champions League places had no effect on the distribution of title odds but Leicester City’s shock run in 2015/16 had a major effect, as odds makers slashed the odds of many potential outsiders this season.